If someone commits to investing the time, effort and financial sacrifice necessary to become a doctor of veterinary medicine or a Ph.D. — or both — it’s only natural to assume that person is passionate about what they do. That is most definitely the case with the faculty and clinicians at the NC State College of Veterinary Medicine. 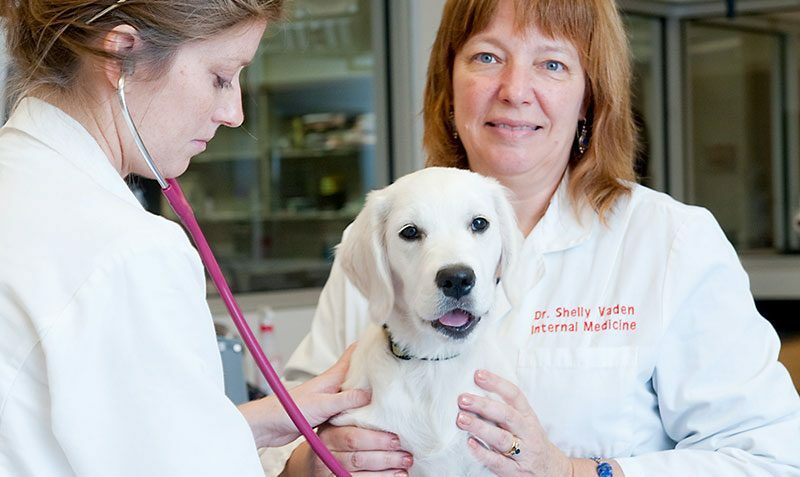 A textbook example is Shelly Vaden, professor of internal medicine. She demonstrates a passionate commitment every day, whether in the clinic, the classroom, the laboratory or her personal life. One her strongest commitments is to the CVM. She arrived as a resident in 1986 after earning a DVM from the University of Georgia and following an internship at Cornell University. The college had just given degrees to its first graduating class when Vaden came to the school, but even then it had a solid reputation as one of the country’s top veterinary colleges in the country. Impressed with the commitment to quality, Vaden stayed, enrolling in grad school to earn a Ph.D. and becoming a member of the faculty in 1991. Since then, she has witnessed the growth and development of the CVM into one of the premier programs in the nation. Vaden’s specialty is urology and nephrology, dividing her time between her work as a clinician with teaching and research. Since much of the work involves teaching in a clinical setting and clinical studies, she says, the line between time spent teaching, caring for patients and doing research can get blurred. Whatever her focus at the moment, however, the frequency of urological and kidney problems keeps her busy much of the time. But not so busy that she doesn’t have time to demonstrate her commitment in other ways. In Vaden’s case, that includes working with — and donating to — a variety of nonprofits, as well as the CVM. Supporting the college is something she encourages members of the CVM community to consider. “We have a special responsibility” to do so, she says. Vaden’s approach is identifying need and targeting support in that direction. For example, there was the time when, coincidentally, she and two other members of the CVM team needed a special rear support harnesses for dogs requiring assistance to walk. None were available through the school and she found that the harnesses were expensive but typically needed for relatively short periods of time. Often the owner is left with an expensive harness that probably will never be used again. So Vaden made a donation specifically for the purpose of buying three harnesses that could be used over and over and available on a temporary basis to members of the CVM community who need them. Support the bright minds of the CVM today. Since then, she has made additional contributions to support specific needs at the CVM that she finds compelling. Her most recent donation was to the Dr. Heather Waterman Huneycutt Endowed Memorial Scholarship Fund. Huneycutt was a 2015 graduate of the college who died in a traffic accident three months later in August 2015. The scholarship covers travel expenses for DVM students who go abroad to work on projects related to their studies. Clearly, Vaden is fully committed to her patients, her students and her college. It adds up to doing her best for the things she’s passionate about. In fact, to put an exclamation point on this story, she was right there during the first annual House Games in Saturday, April 29, when her team, House Salmon, claimed the inaugural House Cup championship. In other words, the bar has been set pretty high for all the other passionately committed members of the CVM community.